AstroFest 2013 is rapidly approaching. Kopernik AstroFest is a celebration of the night sky and amateur astronomy. The 3-day event is held annually at the Kopernik Observatory & Science Center (KOSC). Both the KOSC and the Kopernik Astronomical Society (KAS) sponsor the event. AstroFest includes speakers on a variety of topics, demonstrations, an amateur astronomy roundtable discussion, the Kopernik AstroFest Solar Star Party, and nightly observing if skies are clear. Non-fire camping is allowed on the facility grounds for an additional cost. Kopernik Observatory sports a 20” Ritchey-Chretien OGS Telescope, Celestron C-14 SCT, and a 6” Astrophysics F/12 refractor that will be open for use in observing under clear skies. During clear daytime skies, the legendary Barlow Bob will host the Kopernik AstroFest Solar Star Party (KASSP). 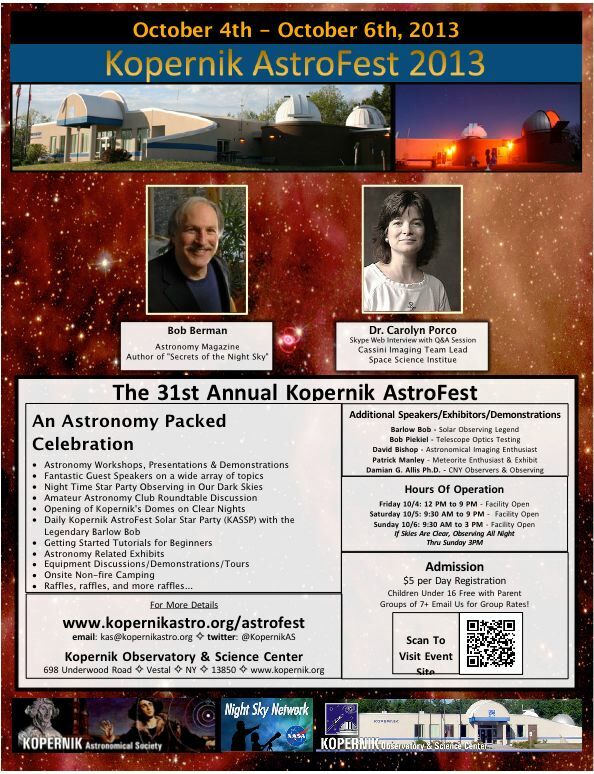 If you are an amateur astronomer located in the Northeastern US, we would love to host you at Kopernik AstroFest 2013. Bob Berman – Astronomy Magazine and author of many nonfiction books. And help us spread the word, click the image below for our AstroFest 2013 Flyer! This entry was posted in AstroFest, Events. Bookmark the permalink.